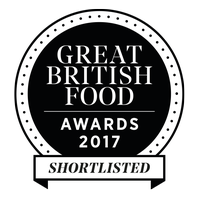 Daisy Gold wins coveted Gold Star in Great Taste Awards. 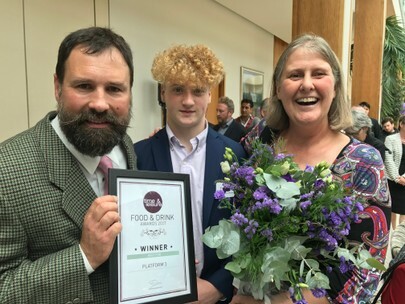 All Citra wins coveted Gold Star in Great Taste Awards. Brightwater Brewery Real Ale and Cider is available to purchase at the prestigious RHS Hampton Court Palace Flower Show 4th - 10th July 2016. We are thrilled to be launching two new products at the show. 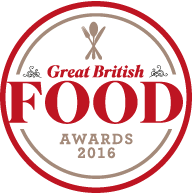 Brightwater Brewery Platform 3 voted Summer Pub of The Season 2016 by CAMRA K&L - thank you we are chuffed to bits. 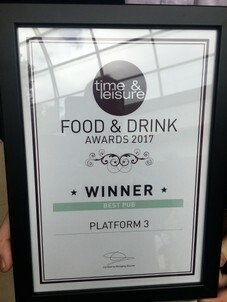 The offical presentation took place on 24th June at Platform 3 in Claygate. 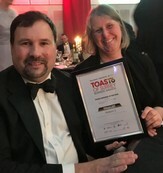 Brightwater Brewery Platform 3 was shortlisted for the Toast of Surrey Business Awards 2016 - we are delighted to announce that we reached the finals of these prestigious awards. 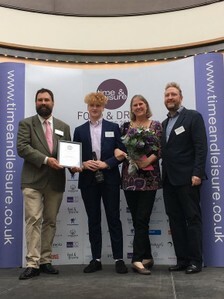 The award evening took place at the end of April and we are proud to announce that Alex and Sue Platform 3 are runners up in the Young Business of the Year 2016 category. 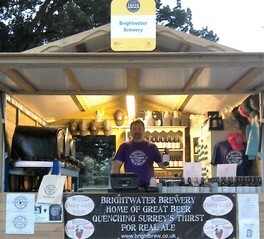 Brightwater Brewery was founded by Alex and Sue in August 2012. After months of planning the brewery was installed, we started brewing and delivered our first firkins in February 2013. Our aim is simple we produce high quality real ale that can be enjoyed by all who taste our beers. Currently we are brewing seven beers Daisy Gold, Little Nipper, Top Notch, All Citra, Lipsmacker, Wild Orchid Vanilla Porter and Wild Orchid Cherry Porter. 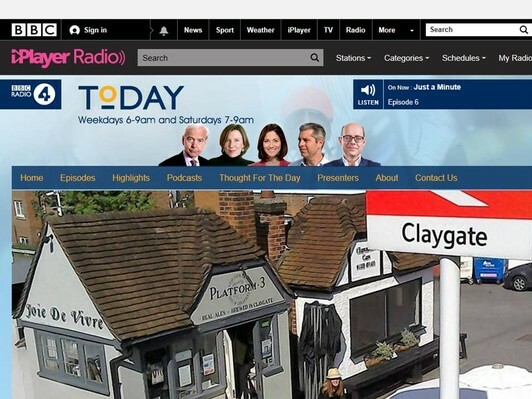 In June 2015 we opened Platform 3 our micro pub located right next to Claygate station. We are open on fine Friday's, Saturday's and Sundays in April and Thursday's, Friday's, Saturday's and Sunday's May to December. 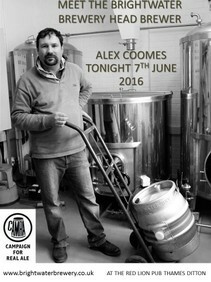 We very much hope that you will enjoy our Brightwater Brewery Home of Great Beer real ales. If you would like our beers to be stocked in a pub, club or outlet near you please get in touch by emailing alex@brightbrew.co.uk - we look forward to hearing from you. Every part of our journey designing and establishing Brightwater Brewery, creating recipes for an expanding range of real ales and setting up Platform 3 our very own little pub has a story behind it. Whilst brewing our very first beer Alex, Founder and Head Brewer, decided he wanted the word Gold in the beer title as it was to be our flagship golden ale. So on a cold January day in a steamy brew house we set about brainstorming nomenclature but as with most things found it hard to agree on what our first commercially produced beer should be called. Batting ideas between us we decided to walk our dogs and continue the brainstorm. Nearing the end of the walk our highly strung, extremely energetic but lovely rescue dog decided to have some fun with us refusing to come back when called instead teasing us with her waggy tailed playful catch me if you can routine. Like chalk and cheese our other dog came immediately when called prompting Alex to say she really is good as gold. Eyes bright in a synchronised moment both Alex and I looked at each other as we said the words Daisy Gold and that was it a beer was born! 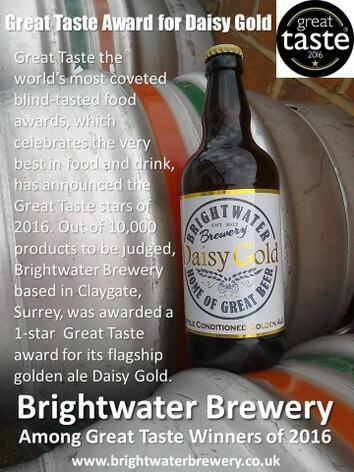 Brightwater Brewery 'Meet the Brewer' Evenings - if you pop down to our little micro pub Platform 3 right next to Claygate Station on a Friday or Saturday the chances are you will be served a pint straight from the cask by Alex our Founder and Head Brewer. Our first 'Meet the Brewer' event took place in January 2014 at The Hare and Hounds, Claygate, Surrey and the second 'Meet the Brightwater Brewer' event took place in February 2014 at Orpington Liberal Club, Orpington, Kent. Daisy Gold, Top Notch and Little Nipper were all available to try and we were delighted to witness that all three beers sold out before the end of the evening. Brightwater Brewery is pleased to provide spent grain to Ray's delightful piglets seen here tucking into a tasty feast!